Five mythical races are vying for Gold in the Orc-lympics! Each players creates a team of Djinns, Orcs, Elves, Dwarfs, Ninjas, and Humans to battle in 7 events to see who can earn the most points for their medals. Orc-lympics is a card drafting and auction game, created by Trevor Benjamin and David Thompson and published by Brain Games. Separate the three 7-point medal cards from the other 12 medal cards. Then, shuffle the 12 medal cards and arrange six with the gold side up (in any order). Next lay the other six below them with the silver side up (two points each) . Shuffle the three 7-point medal cards and put one face up next to the other six gold cards. Put one silver side up (four points) below that, and place the last card in the box. Each player starts with a hand of eight race cards. Players will take one card from their hand, place it face-down on the table and pass the remaining seven cards to the left (like in 7 Wonders). Players will continue taking one card and passing the rest until everyone has drafted eight cards. Each player can only have 3 races in their hand (out of a possible 6: Djinns, Orcs, Elves, Dwarfs, Ninjas, and Humans). Any player with extra races must discard some of their drafted hand until they have only three races. Let the games begin! You will have seven competitions. In each competition, one player will earn a gold medal, one player will earn silver, and all other players will add an exhausted card back into their hand. Starting with the lowest-scoring event, the oldest player begins by playing one (or more) cards from their hand. These cards must contribute at least one point of the color that players are competing for. If a player cannot or doesn’t want to play any more cards they may pass, but once a player passes they may not play any more cards for this competition. Bidding continues until everyone has passed. The player who earned the gold trophy takes the gold card (3-7 points) and the player who earned the silver trophy takes the silver card (2 or 4 points). Each player flips over their played cards into an exhausted pile in front of them. Players who did not win a medal can revive an exhausted champion back into their hand. Continue on to the next competition and the game ends after the seventh competition. The player who accumulates the most points from all of their Gold and Silver medals wins the Orc-lympics! Orc-lympics is a quick game that is easy to learn and open to a variety of strategies. Some of my kids like saving up their champions to win the 7-point Gold, some of us prefer to compete in a few of the battles to accumulate some early points. 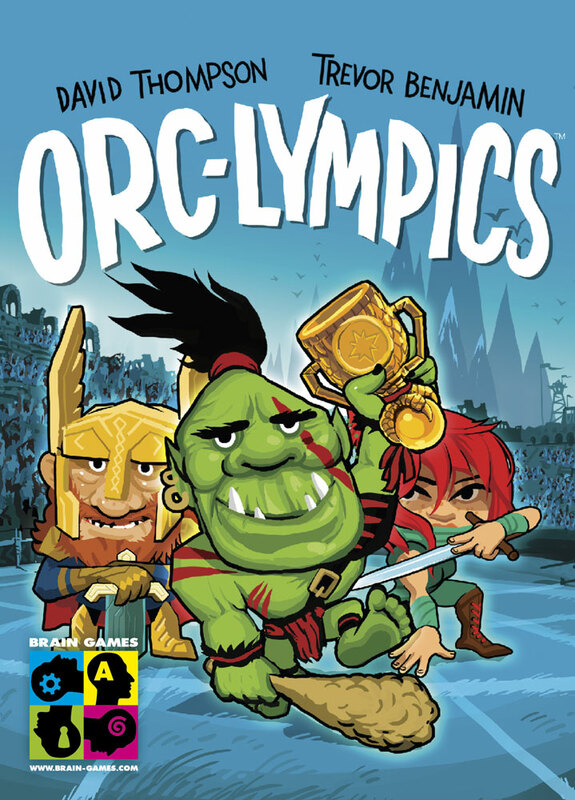 We’d recommend Orc-lympics for its irreverent fantasy theme (e.g. table flipping with Gilbo and Begolas) and quick play. It’s a game that uses a lot of luck as well as strategy, so don’t be surprised if your kids take the gold on this one. The Family Gamers received a promotional copy of Orc-lympics for this review.